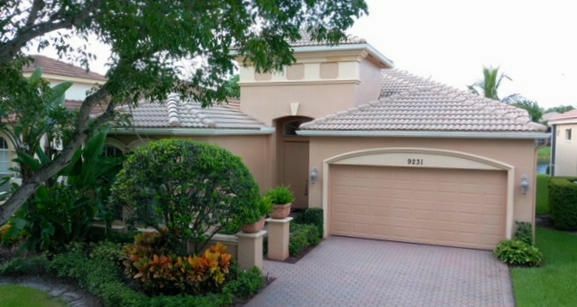 Buena Vida is an active (55+) man gated community of 449 single family homes built by Minto homes in Wellington Florida. Located on Forest Hill Boulevard and 441 (SR-7) directly across from the Wellington Regional Hospital and very close the the fabulous Wellingon Greene Shopping Mall. There are two collections of homes in Buena Vida --The Renaissance Collection starting with 1,886 square feet to 2,734 square feet. ; The second collection is called The Reserve collection. Homes range between 2,535 square feet and 3,328 square feet. Many of these homes are on the Lake.Buena Vida is near the Florida Turnpike and are about 10 minutes from Palm Beach International Airport. Close to City Place for dinning and shopping and to Kravis Center for the performing arts, which has top entertainment shows and plays. Amenities in Buena Vida include a beautiful clubhouse with a grand ballroom where live shows, social events and dinner parties are held. There are Har-Tru tennis courts, billiards, a state of the art fitness center with steamroom and lockers, aerobics classes, a sports lounge, beautiful outdoor pool with cabanas, clubs of all kinds, card rooms, arts and crafts. mens and women's clubs and a myriad of other activities.